These activities were “demand-driven” responding to needs identified by the members. As a consequence, the Institute emerged as the lead provider of broadcasting training in the region. 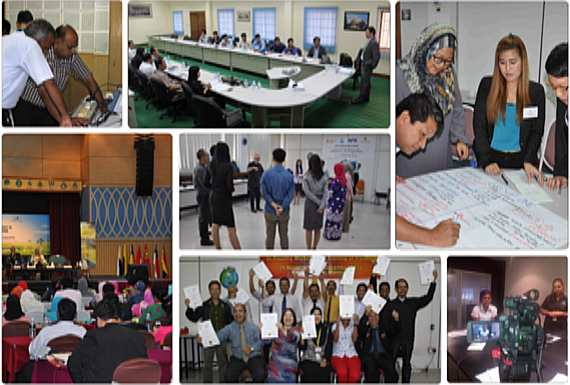 Its relevance and success is manifested by the fact that more than 35,000 personnel from countries within the Asia-Pacific region and other regions have been beneficiaries of the AIBD’s training programme, several of whom now occupy senior managerial positions in the broadcasting industry. The AIBD offers its members and affiliates training programmes in three categories namely Regional, Sub-Regional and In-Country. 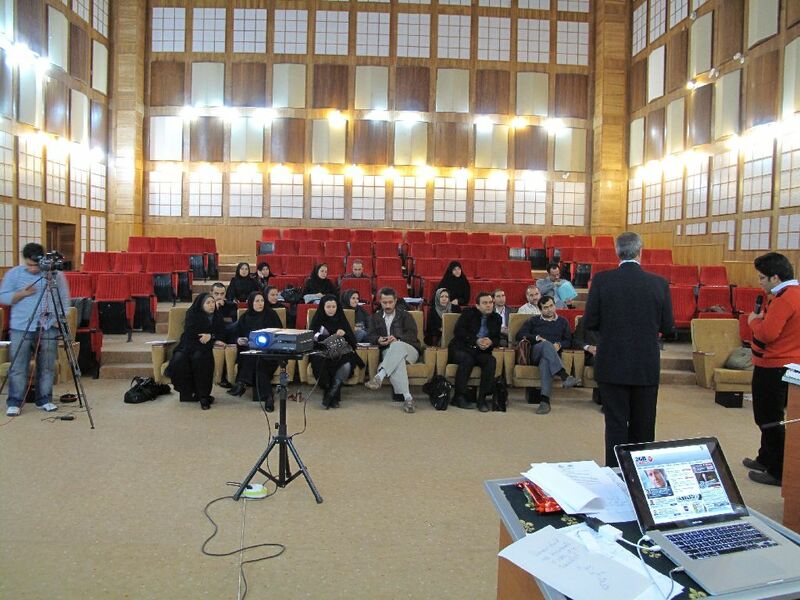 Regional activities like seminars and conferences with common interests are offered to all members and affiliates. Sub-Regional activities are geared towards a particular sub-region like ASEAN, SAARC, Pacific etc which has special needs based on culture, tradition, development etc. In-Country activities are targeted towards a particular country or organisation based on their request and needs. These are typically skills based training and consultancies. The training programmes provided by AIBD cover a wide variety of specialised fields from production to management of radio and television operations, news and current affairs, engineering and digital transmission, public service broadcasting, instructional design & multimedia skills, technology & new media, creative content for programming, children and youth, co-productions and archiving and virtual libraries to name a few. The AIBD offers to its members and affiliates consultancy services in all areas related to media development. This includes new media law, regulatory issues, new management structure, transition to digital broadcasting, digitizing audio-video archives, master plan for HRD etc. 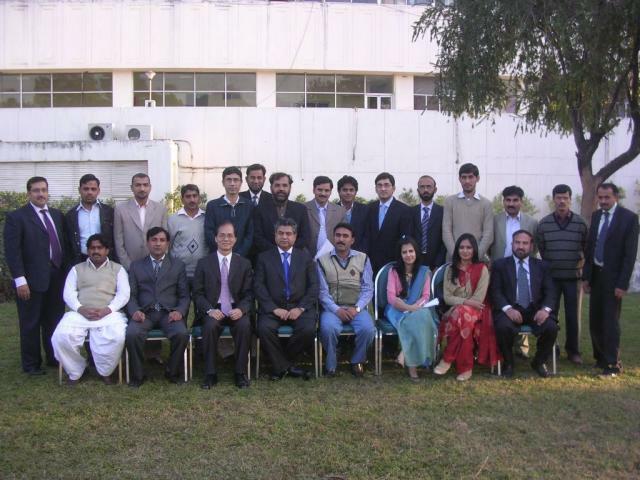 The AIBD/CBA In-Country Workshop on Role of Media in Disaster Reporting was held in Islamabad, Pakistan between 3 and 6 Dec 2010 for broadcast journalists and executives. I was invited by the sponsoring organizations to act as the resource person for the workshop. 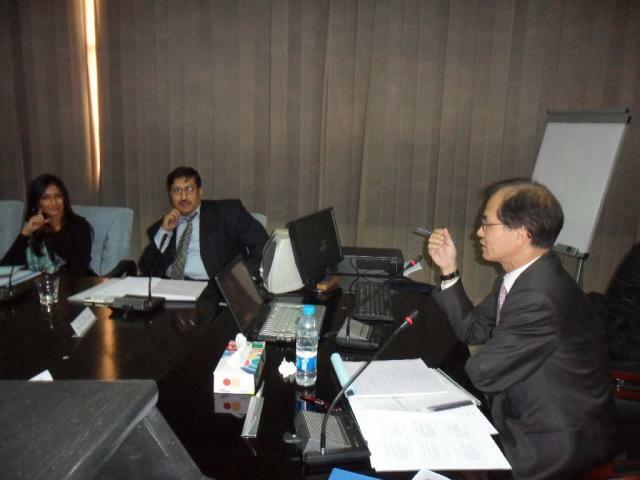 Planning and preparation during the pre-workshop period went smoothly, and our host in Islamabad, Pakistan Broadcasting Corporation (PBC), did an admirable job providing all the support required. 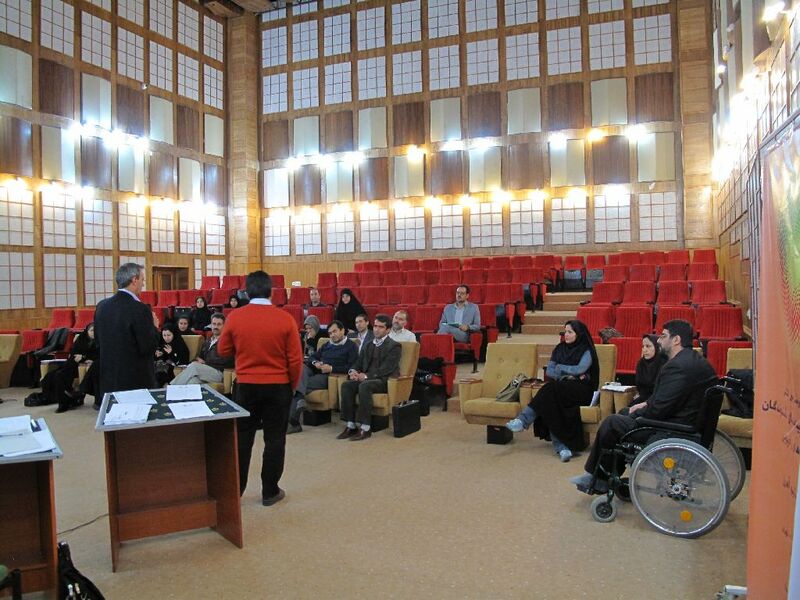 We had been mindful that the workshop should be of a reasonable size to facilitate the effective exchange of views. In the end, it was a near perfect arrangement when we had 21 participants turning up for the workshop. They came from not only Islamabad, but also other parts of Pakistan. Many of them worked for the national broadcasters, while close to one third were in private media. A very good mix indeed! I went into the first day of the workshop with feelings of trepidation. After all, this was my first visit to the premises of PBC/Radio Pakistan. However, my unease dissipated rather quickly. The group I was leading turned out to be active and responsive. Most of the participants warmed up to the discussions after the first hour or so, and as the day went by, the flow of discussions took on a fairly brisk pace. Not once in the sessions did I have to pick out a name in the list to demand a contribution from the participants. 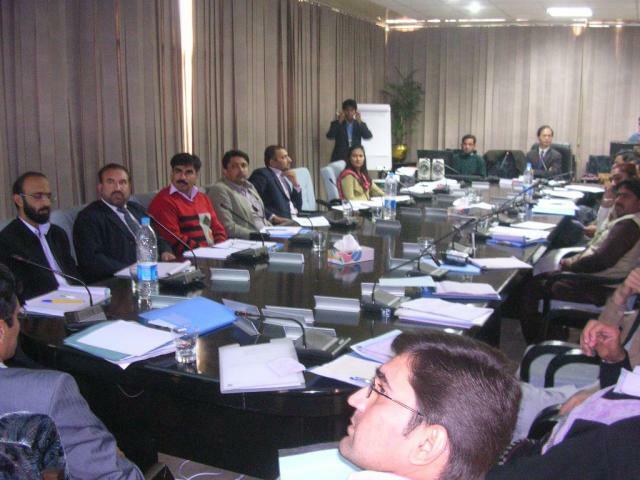 Interventions and questions came voluntarily and naturally in the sessions. including “Role of media in a disaster situation”, “Editorial principles”, “An emergency broadcast plan”, “Hurricane Katrina and the lessons learned” etc. Ample time was set aside for participants to present, and share their experiences dealing with the recent flooding in Pakistan. There was no lack of lighter moments. PBC, our host, proposed a visit to the Lok Virsa Museum in the afternoon of the second day. This was agreed and met with loud and long applauses from the group. So we all went – it was a warm, sunny afternoon -- and spent two hours in the museum, which had an impressive display on Pakistani heritage from early days to the present time. The visit was a particularly pleasant one for me, because it gave me the opportunity to talk to the participants outside of the classroom. They showed excellent knowledge about the exhibits and were my “unofficial” guides for the tour! So it was four days which went by very quickly. 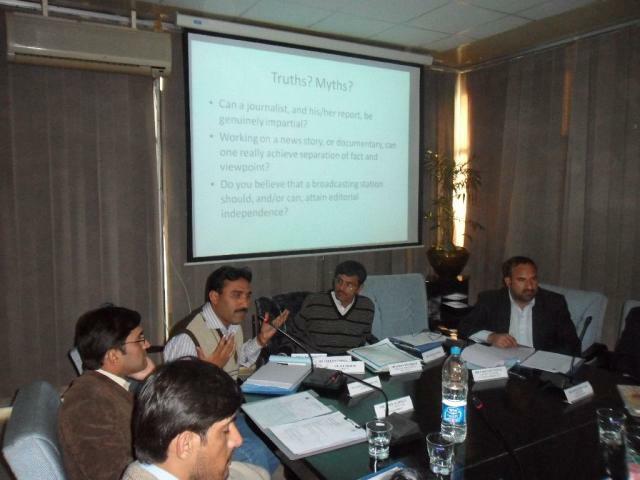 The workshop had provided a rare opportunity for practitioners in both the public and private media to engage in debates and discussions. I was impressed by the wealth of experience this particular group had demonstrated during the sessions, and the excellent presentations they had produced. I should add my gratitude to all those who had provided assistance, and to all the participants, all of whom so enthusiastic and good-natured! Overall, I think we had a successful workshop, and the feedback from the participants asked for more of such training opportunities. Our hosts, too, showed that they were keen on building human resource capacity. 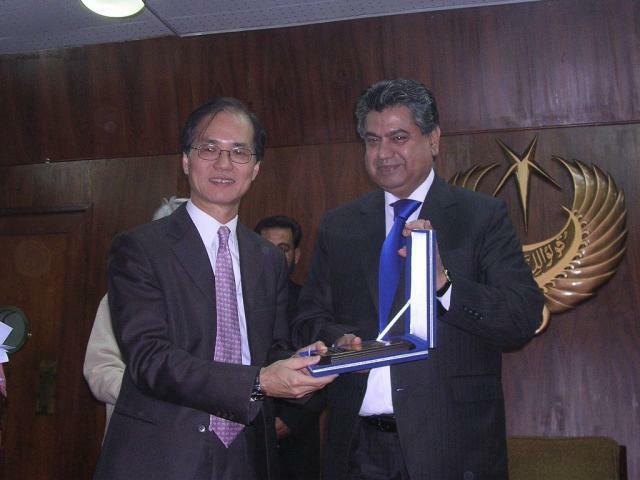 PBC’s Director General, Mr Murtazar Solangi, personally hosted both the opening and closing ceremonies. When the certificates were handed out, it was the happy conclusion of four days of useful work by all concerned!